Today GOLD PRICE backed off $7.80 (0.6%) to $1,146.00 while SILVER through tight-clasped fingers gave up on 1.9 cents, closing at $15.106. Ain’t no cloudy sky here at the Moneychanger’s. This is normal market action. Both silver and GOLD PRICES have rallied off July lows. Rallies, remember, go up and down, zig and zag, two steps up, one step back. 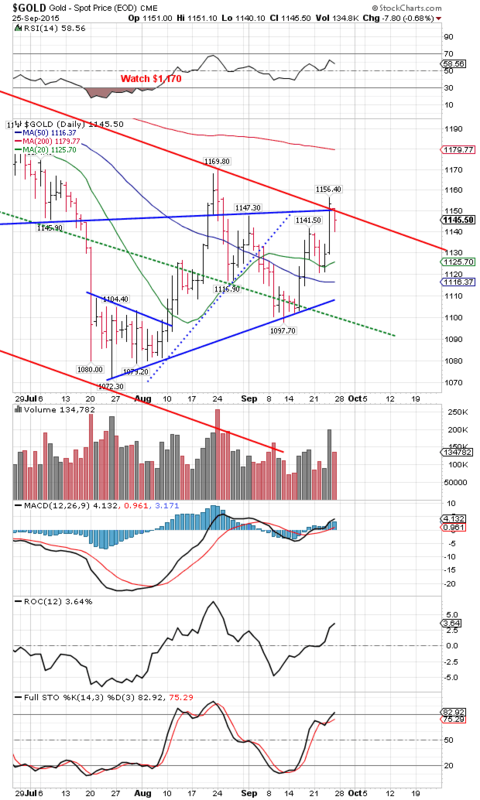 Yesterday the gold price hit that downtrend line from the January high, and today backed off a smidge. Recall yesterday, when it rose $22.20, and be content. Recall the market proverb: bulls get rich, and bears get rich, but pigs get slaughtered. 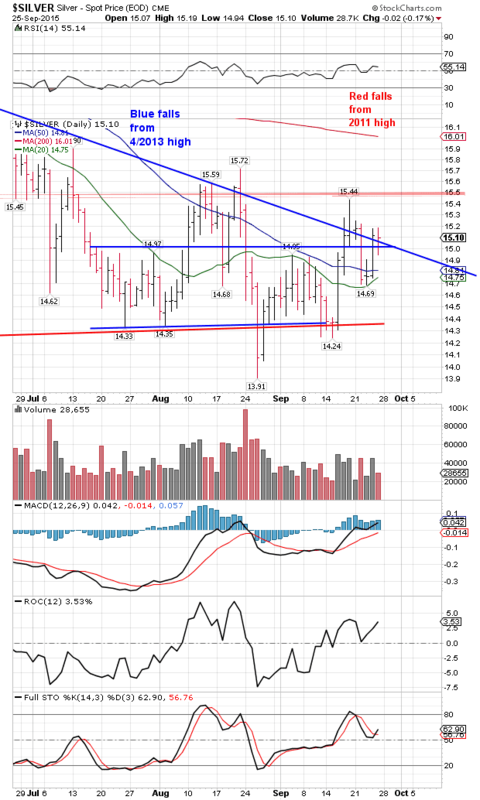 Yesterday SILVER ran into the downtrend line from the April 2013 high. Again, at major resistance markets often have to take two or three runs at it to break through. Look, it’s in an uptrend — higher highs and higher lows — from the July bottom. It’s the early stages of a rally. Wait till the jet fuel kicks in. Time to buy silver and gold. The long winter of correction has passed. In the global scheme of gold and silver markets, we in the retail market are mere pissants. Yet last week one pissant retail dealer I know bought a big ($5 bn/yr +) dealer out of 100 oz bars (he refused to sell any more) AND thousand ounce bars. Deliveries of 100 oz bars and one ounce rounds have stretched out to 4 – 6 weeks, nobody knows when the US mint will deliver silver American Eagles, and the Canadian mint has fallen behind on delivering silver Maple Leaves. Those who have a few silver American Eagles are selling them north of $5/oz over spot, and US 90% silver coin, one of the very few actually in hand and shippable silver, costs $4.65/oz over spot at wholesale. Almost everything else carries a wait of 4 – 6 weeks. Even given the American silver retail products industry’s tinyness as opposed to the world market, doesn’t it seem awfully curious that this little pissant corner of the market could run slap out of silver? I don’t fancy those internet gurus who can leap to tall (unjustified) conclusions at a single bound, but this retail market silver shortage leaves me wondering just how much silver really exists in the world — silver that can be brought to market immediately. If our little footnote market indicates anything, it’s that far less ready-for-market silver exists than people suspect. I’ve always called silver the Rodney Dangerfield of precious metals because it don’t get no respect, but one of these days silver will avenge that contempt with soaring prices. Hide’n watch. Demonstrating that the American public may in fact be as stupid as Our Masters believe, stocks rose today after Comrade Janet Yellen’s drooling about higher interest rates to come later this year. In a pig’s eye. Anyway, emboldened by Janet’s silly blarney, stock buyers eager for punishment crowded in and ran the Dow up 264 points, but, whoops, after 2:00 the rats started leaping out of the ship and it closed up only 113.35 (0.7%) at 16,314.67. S&P500 fared not so well, ending down 0.9 (0.05%) at 1931.34. Is this bad? Let me count the ways. First, stocks made the gains, but were too weak to hold on to them — too many sellers waiting for just one more tick up. More, the S&P500 and the Dow gainsayed each other, not ever a rosy outcome for indices that kiss and hold hands. Finally, both indices ended the week lower, never a token of good times to come. Speaking of sellers, y’all ought to take advantage of ANY stock rally to sell stocks. More weeping, wailing, and gnashing coming. US DOLLAR INDEX followed stocks up, climbed over its 50 DMA, shot up to a 96.88 high, then fell back to close almost dead on the 50 DMA (96.42). Buyers and sellers evenly matched. Dollar will eventually resolve, downward. Ultimate target is a dollar index below 50. The UN has published its Global Goals which promise to end extreme poverty, fight inequality and injustice, fix climate change, and cure athlete’s foot and halitosis. Where do they get this stuff? Listen, folks, all these moonbeams will vanish quicker’n you can say “Morons in charge” when the economy gets tough, and toughen it will. Truth is, if you can’t survive digging grubs out of flower pots, you may not make it. Y’all hear that, millennials? Ain’t no Starbucks in flower pots. I ain’t worried. I got me a tin bill and I can peck in the dirt with the chickens.